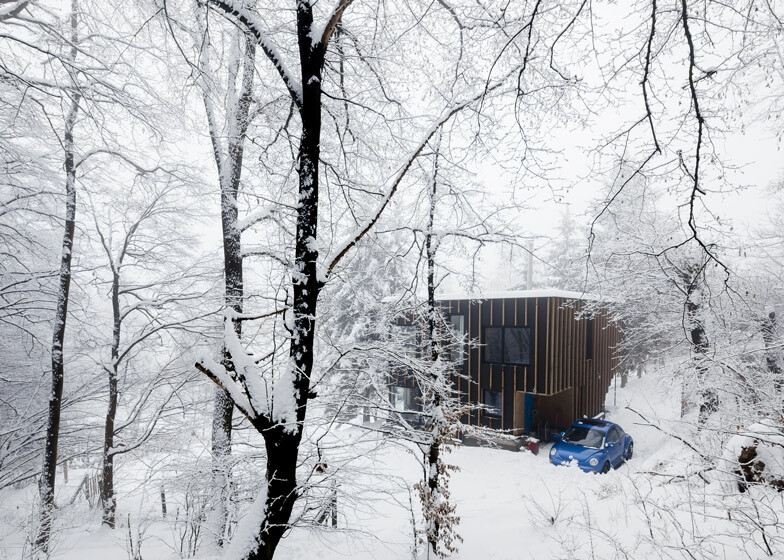 This boxy wooden cabin with an assortment of circular and rectangular windows was built by Hungarian studio T2.a Architects in just two days in a forest outside Budapest (+ slideshow). 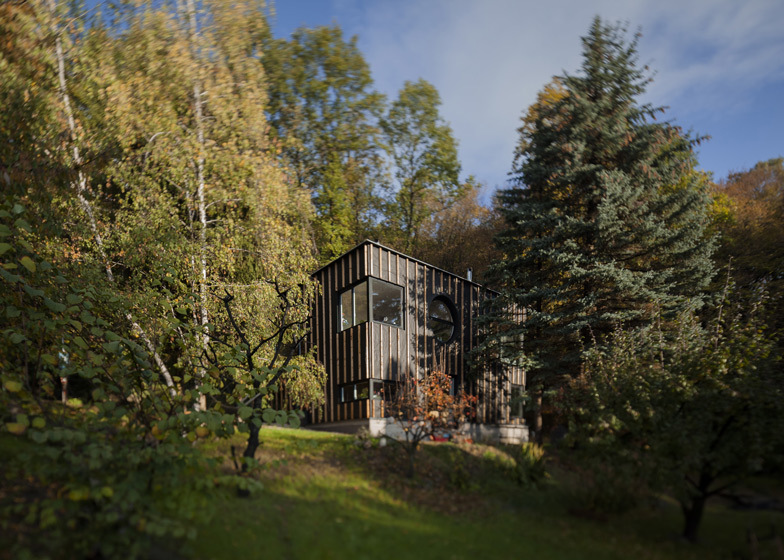 Bence Turanyi of T2.a Architects designed the Photographer's House for his friend, photographer Zsolt Batar. 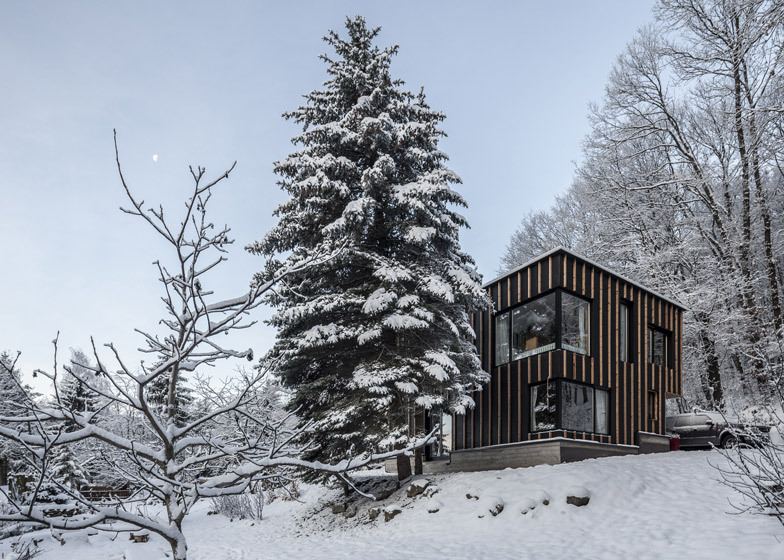 The architect used prefabricated and cross-laminated timber panels to construct the house, meaning it could be put together extremely quickly and easily. Both the architect and the photographer brought different ideas to the project, but their overall aim was for "a building which looks good and unique, is of excellent quality, and can be built during very short time and for a reasonable price". "When two different ways of thinking meet, the result is something completely new," said Turanyi. "Our conversations about art, architecture and design were brought to life in this house." Rectangular windows stretch around each corner of the building, while smaller square and circular windows are positioned along the sides. 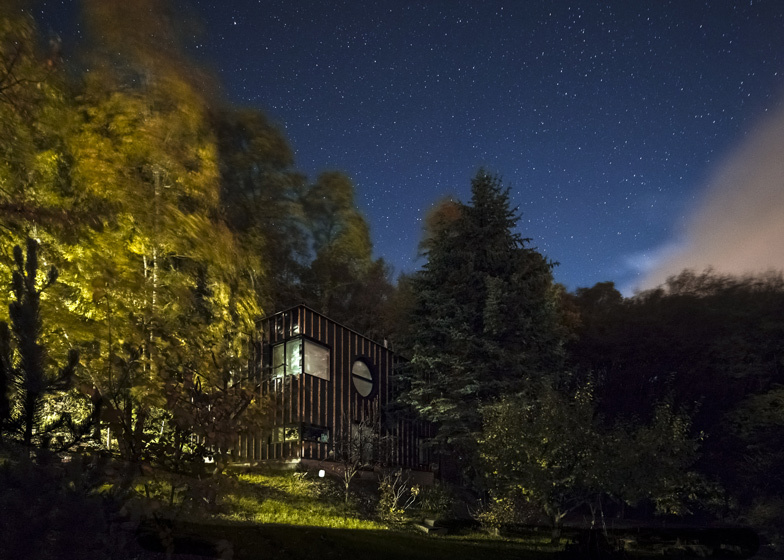 There are two floors inside the cabin; an open-plan lounge and dining room make up most of the ground floor, while a pair of bedrooms and bathrooms can be found upstairs. 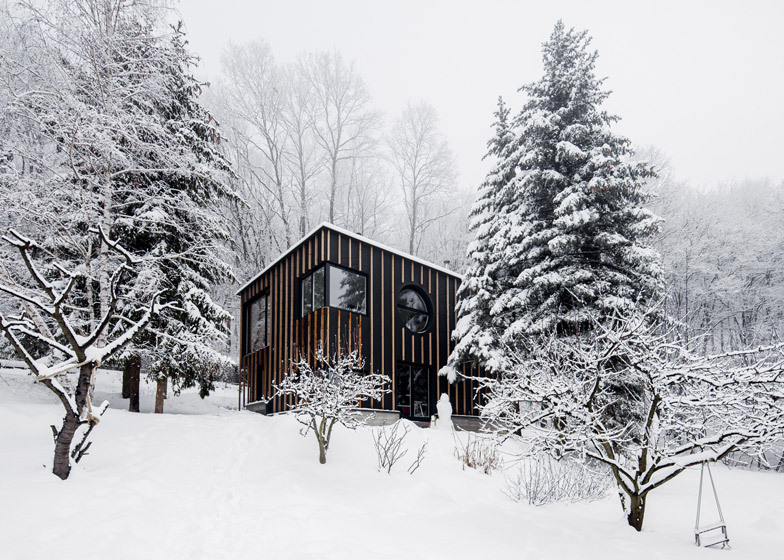 Wooden panels line walls, ceilings and floors throughout the house, and floor-to-ceiling windows offer views out into the surrounding forest. Photography is by Zsolt Batar. 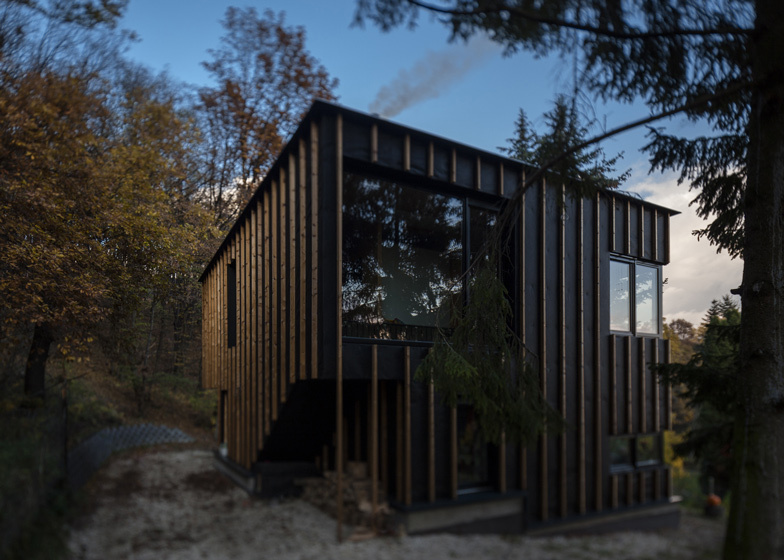 Architect Bence Turanyi and photographer Zsolt Batar decided to unify their artistic and professional visions, and the result of their work is an extraordinary house in a forest. The idea behind the building was to create harmony among man, nature and economic aspects. 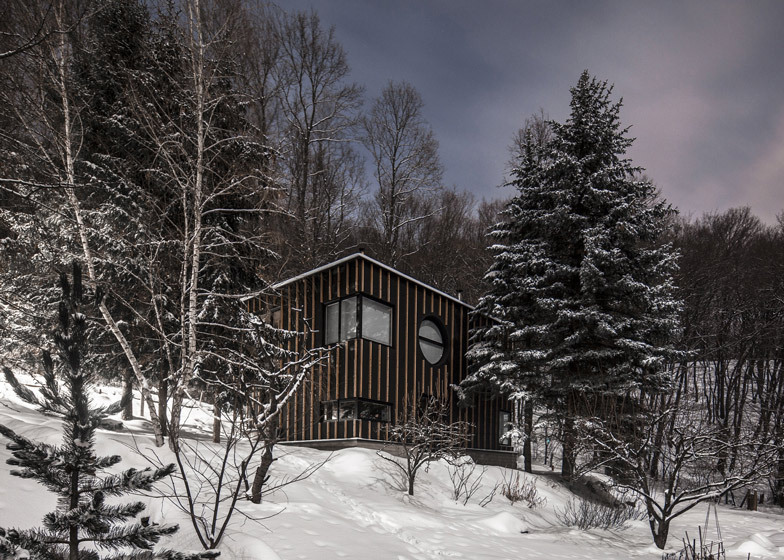 The sustainable wooden house breathes together with the surrounding trees, and its life is documented by the artist who lives in it. 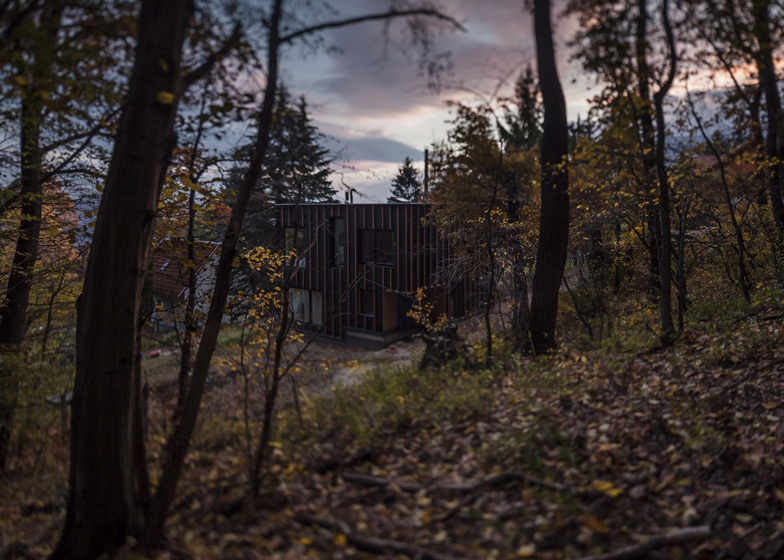 The house was one of the favourites of the international jury for Hungary's Media Architecture Prize 2013. 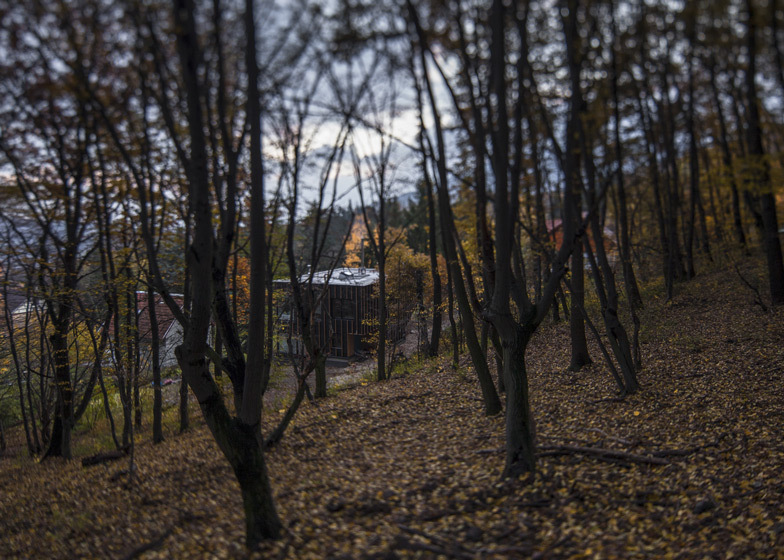 If I would have to tell one story to define contemporary Hungarian architecture, among the finalists of 2013, it would definitely be the story of Bence Turanyi's house – this is how Daniel Kovacs, member of the professional jury of the Hungarian Media Prize 2013 commented on The Photographer’s House. The birth of this exceptional building is the result of the co-operation between an architect and a photographer, which is much more than a traditional client-architect relationship. Owner of the house, renown architectural photographer Zsolt Batar is an old friend of Bence Turanyi. The two brought ideas and ways of thinking from their own areas, and unified them in a common project. "When two different ways of thinking meet, the result is something completely new. Our conversations about art, architecture and design were brought to life in this house." - says Bence Turanyi about the crossover experience. 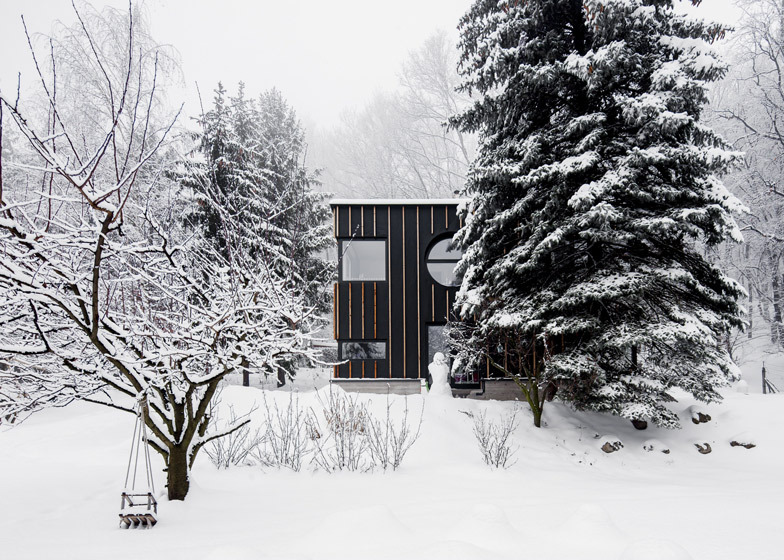 For Zsolt Batar, the house is not only a home, but also a source of inspiration. 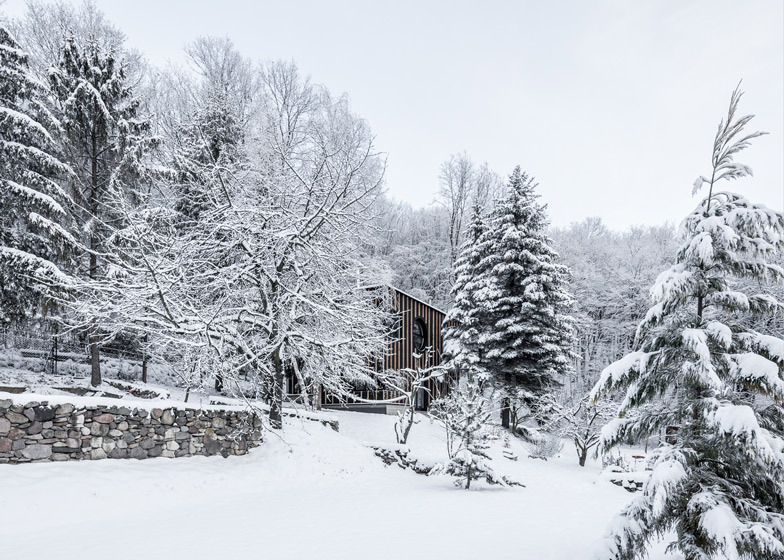 The series about the house has become an important milestone in his artistic career: he records the relationship of the house and the forest day by day, in every season. Architecture is in a new and challenging situation nowadays thanks to significant changes in the economical and social environment. We still need well-structured, quality houses, but often there is a choice among sustainability, technology and price. The creators wanted a building which looks good and unique, and is of excellent quality, while it can be built during very short time and for a reasonable price. A mere week passed between sending the digital data to the manufacturer and the completion of structural assembly on site, while the House was built in two days. The structural framework of the House is made of prefabricated, cross laminated and glued timber panels (CLT). 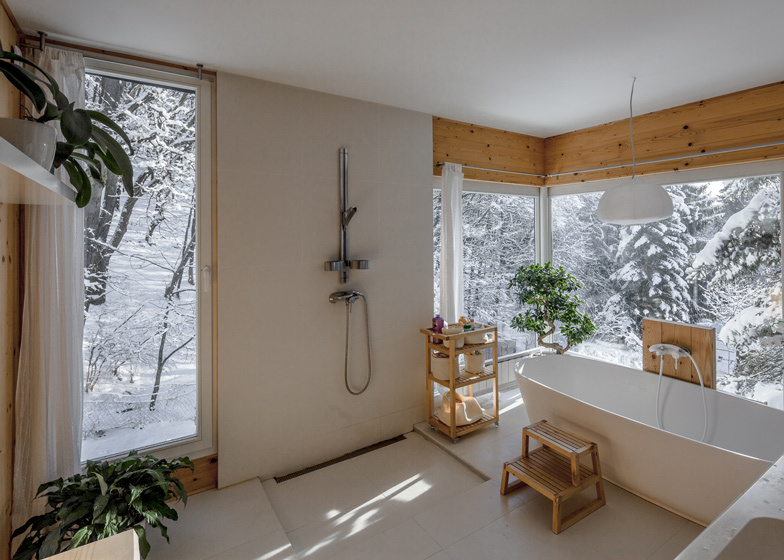 The Photographer’s House is a unique example of slow design: you can get your hands dirty while you collect wood from the forest to heat the fireplace, it sharpens all your senses thanks to the vivid presence of the forest, and it creates an emotional bond among man and nature. 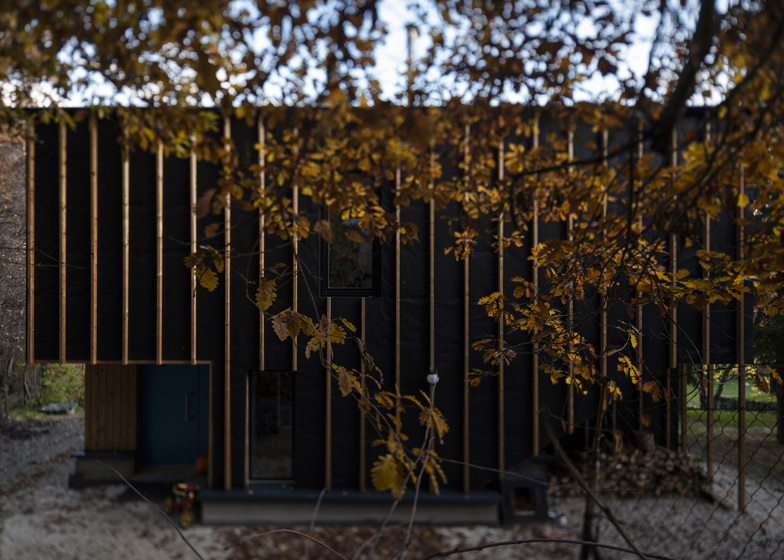 The House literally breathes together with forest, while in the inside there is the constant smell of wood. And this special smell is part of the living structure of the building. In wintertime, the fireplace heats the house, while during summer nights cool breezes from the woods are let through the open windows.